Chennai: SunEdison, the Indian unit of US-based MEMC Electronic Materials Inc., has arranged $110 million (around ₹ 560 crore) in financing for its two solar power plants in Gujarat and Rajasthan. The plants, which will have a combined capacity of 50 megawatts (MW), will be operational at the end of the year and generate a total of 84,000 hours worth of electricity in a year. Audit firm KPMG estimates India will need nearly $110 billion in investments in the next 10 years to drive solar energy. “This is still a nascent industry but has potential for growth and it depends on how the initial projects go. It takes about 8-10 years to break even with such projects," said Sanjay Chakrabarti, partner at audit firm Ernst and Young. Besides, conventional power is cheaper at ₹ 5-5.50 a unit, compared with ₹ 11-13 a unit for solar energy, according to a May report by KPMG. “Solar energy is currently not commercially viable. 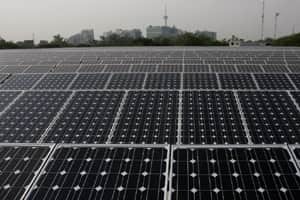 But the industry has demonstrated considerable reduction in costs and the government is supporting the industry with the belief that costs will go down further and will at some stage be used commercially," said Pashupathy Gopalan, managing director, South Asia, at the SunEdison. The firm hopes to capitalise on the renewables purchase obligation India has imposed on electricity generators and distributors, making it mandatory for them to include a percentage of solar and wind energy in their total requirement. SunEdison has so far set up five plants for the Gujarat government with a combined capacity of 50MW. “Having arranged more than $2.5 billion in project financing and having managed more than 500 power plants throughout the world, we are comfortable with raising money," said Gopalan.